What this site really needs is some gratuitous 1960s glamour. So who better to provide that than the iconic daughter of an iconic crooner. Sinatra is – obviously – the daughter of the legend that is Frank Sinatra. Like her father, she had a gift for phrasing and timing in her singing that, in my mind at least, sets her apart from your some of the other female singers of the time. Her time was the mid-to-late-60s, and she will forever be associated with that time. Most well known for These Boots Are Made For Walkin’, Sinatra was far from a one-hit wonder, scoring hits with her father (Somethin’ Stupid), with Lee Hazelwood (Did You Ever), the James Bond theme You Only Live Twice. And this little ditty. Sugar Town is a song written by Lee Hazelwood, and is a laid-back, light and airy, slightly jazzy song that effortlessly drifts by. When Hazelwood was criticised for providing the “worst lyrics ever written in a top 10 song”, he retorted with “Hey, I spent a lotta time writing a bad lyric like that! The words are as stupid as I could get ‘em”. But Hazelwood has since confirmed that this is, in fact, a drugs song about LSD. Whilst Sinatra was aware of this, record company, radio and others were oblivious to, or overlooked, these references. So here is the song sheet. Nothing complicated here, just a repeating set of simple chords throughout. I also transcribed the little trumpet riff in the middle and at the end, if you fancy it. This is a lovely little song to sing, so give it a try. Enjoy! Categories: Pop | Tags: 1960s, 1966, Nancy Sinatra, Pop, ukulele | Permalink. I’ll be honest. Magazine aren’t a band that I’ve ever been a huge fan of, or know too much about. Not because I don’t really like them, but more through ignorance. There’s a lot of music out there, and catching up on all of it is a hopeless task. But recently I’ve been listening to quite a lot of post-punk-type compilations, and Magazine crop up on a number of those quite regularly. This song in particular (alongside Shot By Both Sides) seems to crop quite frequently, and has wormed its way into my head. Magazine were formed in 1977 when lead singer Howard Devoto left the influential Manchester punk band Buzzcocks after their first EP. They are often considered one of the first post-punk bands, thought of as an artsier and more experimental form of punk. 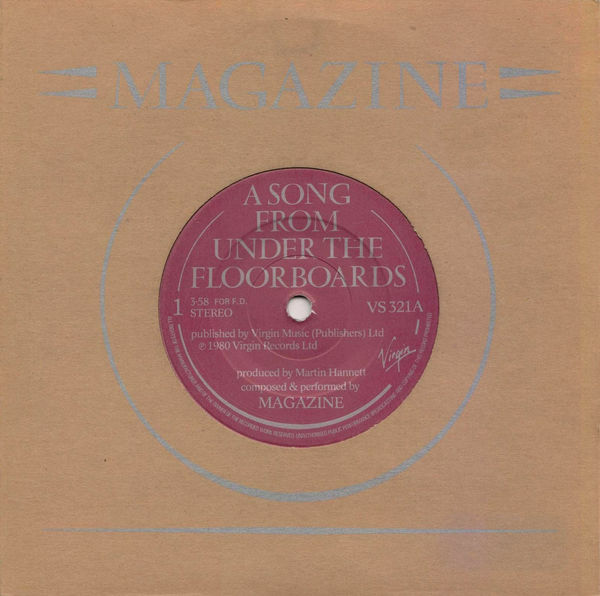 Song From Under The Floorboards was taken from their 1980 album The Correct Use Of Soap. Lyrically, this is a somewhat intruiging song, and I won’t pretend to understand what it’s all about, but it has been suggested that it is based on ‘Notes From the Underground’, a novella by Fyodor Dostoyevsky, in which the main character debates the concept of free will, regrets his lack of direction in life, and glorifies himself as a product of society, in turn condemning that society. Released as a single in 1980, the song has been recently covered by Morrisey, as well as by Simple Minds. Here’s the song sheet. There’s quite a bit of guitar tab out there for this song, but (unsurprisingly!) nothing for ukulele. It’s fair to say that this is an approximation of the original, and could probably do with some work and verification. But I’m putting it out there in the hope that somebody somewhere might be interested. Note that I’ve also included some tab for the guitar riff introduction – that again is an approximation as the limited range of the ukulele makes it difficult (impossible) to do it properly. But I think it sounds OK. Enjoy! Categories: Indie, Post-Punk | Tags: 1980, 1980s, Indie, Magazine, Morrisey, Post-Punk, ukulele | Permalink. It’s the mid-80s, and the phenomenon that is Frankie Goes To Hollywood is everywhere. This isn’t a time for subtlety – Frankie reflect the times and are big, loud and brash. Relax, Two Tribes, even the ballad The Power Of Love are not exactly wallflowers. Thanks to Trevor Horn’s everything-including-the-kitchen-sink production these songs are huge, in-your-face efforts that are reinvented each week with a new re-mix and new pseudo-intellectual posturingfrom Paul Morely. This isn’t necessarily bad – I like these records, Two Tribes in particular is wonderful, and the whole Frankie thing certainlty made for colourful times. The label that Frankie emerged on, ZTT, was the brainchild of Morley, Horn and Jill Sinclair, and was hugely distinctive in both its music (Horn’s production fingers were all over it) and in the way it presented the music. Amongst the roster of other artist on the label at the time was the German synthpop group Propaganda. In it’s original incarnation the band only managed a single album, 1985’s A Secret Wish. But what an album that was. More musically capable and coherent than Frankie Goes To Hollywood, this was definitely a ZTT record, but had much more of an experimental European sound to it. 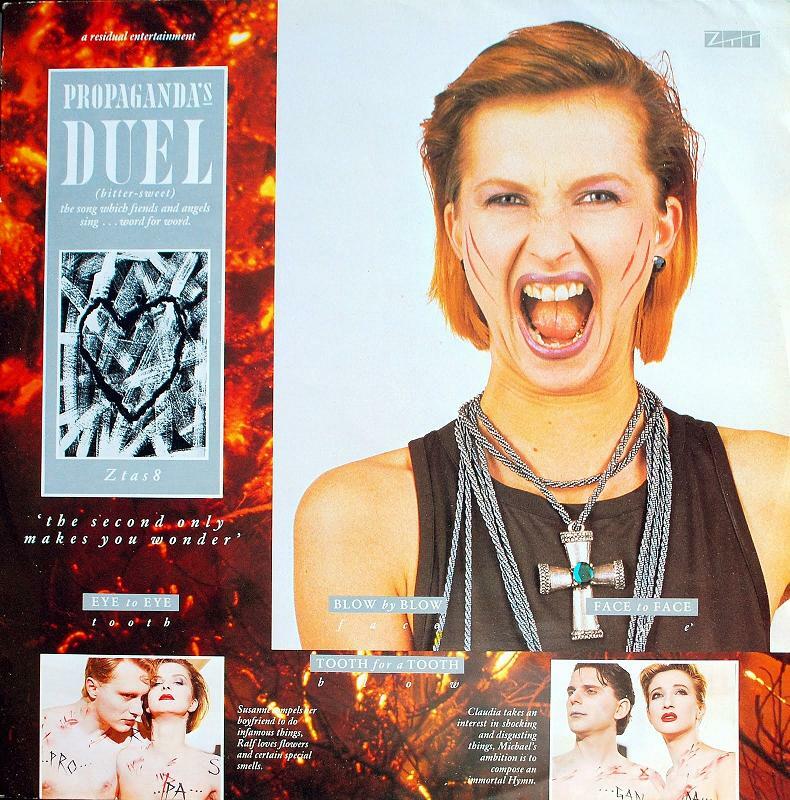 Duel was a single from that album, and gave the band their only Top Of The Pop performance. It was by far their most poppy effort, although alternative version Jewel is a far a more aggressive, industrial style take on the same song, at times unrecognisable compared to the original (there is also a remix version which combines the two). Ultimately Propaganda suffered from the huge success of Frankie Goes To Hollywood, which diverted effort and resources away from promoting them, and so seem to languish in the twilight world of 80s almost-made-its. That is a shame, because for a short time at least Propoganda had something original and exciting to offer. And this on ukulele? Well why not! As I said earlier, this is probably Propaganda at their most popy and tuneful, so it really is a good sing-a-long. The song comes with quite a few chords, one or two not too common, but nothing too tricky. Probably best to forget that huge Trevor Horn production and trim it back to the basics of the tune, and there you’ll find something very lovely. Enjoy! Categories: Post-Punk, Synthpop | Tags: 1980s, 1985, Post-Punk, Propaganda, Synthpop, ukulele | Permalink.